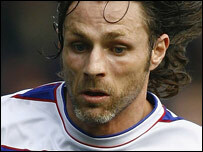 QPR's veteran winger Gareth Ainsworth has said he has ambitions to be a coach or manager once his playing days end. The 34-year-old, who has been helping manager Luigi de Canio this season, told BBC London 94.9: "The boss asked me to be his right hand man. "I help out in team talks and get his messages across on the pitch and I'm happy to do that. "I'm learning so much everyday so hopefully I'll pick up a few badges and one day be a coach, or a manager even." But Ainsworth, who scored in Saturday's 2-2 draw against Preston North End, says he is still enjoying his time on the pitch. "I have a playing contract until I'm 36 and there's plenty of playing-time left in the legs," he said. "The lads have got respect for me. I've got about 500 games behind my career and 20 years and we've got some young lads here and if I can offer any advice to them and it rubs off on them then I'll be a happy man." The former Cardiff City man joined QPR after he was released from the Bluebirds in June 2003. "I'm enjoying the coaching role, I'm enjoying being in the technical area and I'm learning a lot," he added.